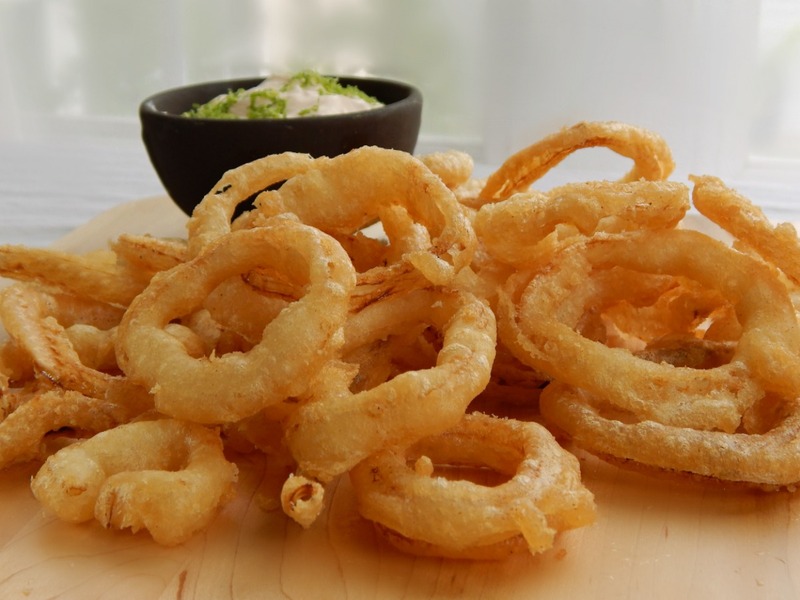 If you could conjure up the lightest, crispiest, most ethereal onion rings, these are them. The beer batter just barely clings to any vegetable lovingly dipped in it, but don’t be deceived; these have a serious crunchiness. Best of all, these are well-behaved rings: no drooping, no slipping. Reminiscent of an Italian Fritto Misto crossed with a Tempura, this beer batter would make anything taste good. I began with onion rings and moved on to what ever random vegetables I had hanging out in the kitchen. No reason to stop there – seafood would be lovely as well and I can’t wait to try a par-cooked asparagus. These onion rings are made with Vidalia onions, but any sweet or just regular old onions are good, too. Beer can be replaced with club soda or soda water – they’re still delicious. A simple Chili Lime Dipping Sauce takes these over the top, although I fear the little bit of yogurt in the sauce does little to salvage any hope for nutritional redemption. It does, however, give a nice tang. The sauce, by the way, is simple amazing with any number of things, Stupid Simple Sweet Potato Fries, for one. 1 1/3 cups ice-cold beer. Place onions in a large bowl filled with cold water and soak for about 10 minutes. Drain and dry on a clean kitchen towel. Mix all batter ingredients together in a bowl. Place bowl over ice water. Heat about 2 inches of oil in a heavy pan to 365 degrees. Put dry onion rings in batter. Lift out a small handful at a time, allowing excess batter to fall back into bowl. Carefully place in hot oil and fry, turning once, three to four minutes until golden brown. Remove and drain on a rack over a sheet pan. Salt while still hot. Stir together Mayo, yogurt, chile sauce and lime juice. Grate lime zest over the top. I have no idea on how, exactly, to figure the nutritional value in this – the batter is not all used, and the oil is problematic – obviously, some is absorbed, but how much? Let’s just say don’t eat these often! Vidalia Onions: Well, yellow or white onions are more inexpensive, but a pricier Vidalia is a small splurge that won’t break the bank. Oil: If I use oil like this, I’ll give it a strain, and if it’s hot out, I’ll throw it in my freezer so it can be used more than once. If I’m going to saute something, I’ll pour a little of this “slightly” used oil in the pan. No sense in wasting. Flour and baking items: Try to buy during Holiday sales, when the prices are lowest and coupons are available. Beer: Always on sale during any holiday! This entry was posted in Click here for Fabulous Food Posts and tagged Alcohol, Appetizer, Beer, Condiments, Deep Fried, Lime, Mayonnaise, onion rings, Vegetable Side, Vidalia onion, Yogurt. Bookmark the permalink.